A Contract for Difference (CFD) is a structured financial derivative which replicates the price action and movement of an underlying security or investment product. The concept of a CFD is that it mirrors the underlying asset in terms of price movement but does not transfer the ownership of the asset. The flexibility of trading CFDs means that when you enter into a buy or sell contract, all you are concerned with is the price movement and size of your trade. The ability to trade only price movement removes the stress of taking physical delivery of a product which can happen if you buy and sell exchange traded futures contracts. 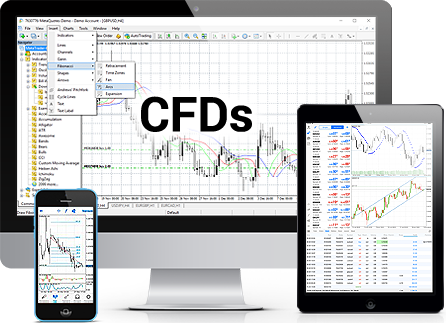 CFDs allow you to trade using margin which means you can trade larger volumes with less upfront cost. This gives the short and long term investor the ability to execute their investment strategies quickly and efficiently. Whether you are looking to hedge your current investment portfolio or looking for the ability to trade short term strategies, CFDs provide any investor with easy access to the global financial markets. Learn more about the markets and CFDs at our One Trading Academy or try setting up a position on a Demo Account today.